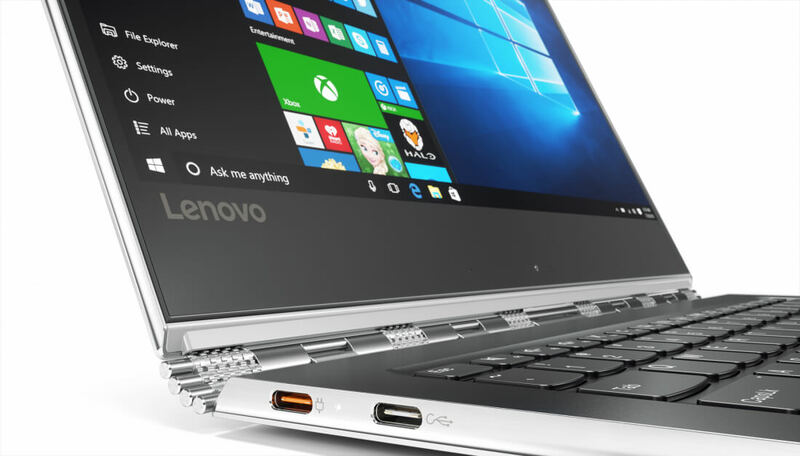 Along with the unique Yoga Book, Lenovo has announced three other products at IFA 2016, headed by the upgraded Yoga 910 laptop with a new Intel 'Kaby Lake' processor inside. The Yoga 910 is a continuation of Lenovo's high-end ultraportable line, packing a 7th-generation Intel Core i7 CPU into a 14.3mm slim body. Like the Yoga 900 that came before it, the Yoga 910 features Lenovo's signature watchband hinge that allows the 13.9-inch display to rotate a full 360-degrees, transforming the laptop into an oversized tablet. You'll find other high-end hardware in the Yoga 910. The display tops out at 4K, although there's also a 1080p option for those who'd prefer longer battery life (15.5 versus 10.5 hours). Buyers will get up to 16 GB of memory, up to 1 TB of PCIe SSD storage, a fingerprint reader, and two USB Type-C ports: one is USB 3.0, and the other USB 2.0 with charging support. The Yoga 910 will be available in October starting at $1,299. The Yoga Tab 3 Plus is Lenovo's inexpensive 10-inch Android tablet, featuring a 2560 x 1600 display and a unique stand that props up the tablet for media consumption. On the front of the IP52-rated splash-proof device are four "theater-caliber" JBL speakers, and internally there's a massive 9,300 mAh battery for up to 18 hours of use. Other hardware in this $299 tablet, which will go on sale in October, includes a Qualcomm Snapdragon 652 SoC, 3 GB of RAM, 32 GB of storage with a microSD card slot, USB Type-C, LTE connectivity, and a 13-megapixel rear camera. The other tablet Lenovo has announced is the Miix 510, a 12.2-inch 1080p Windows 10 device that docks into an included keyboard. The Miix 510 is surprisingly powerful, packing up to a 6th-generation Intel Core i7 CPU, though we're not seeing Kaby Lake inside. There's up to 8 GB of memory available, along with up to 1TB of SSD storage, and the 39 Wh internal battery is rated for 7.5 hours of use. Also available in October, the Miix 510 will cost at least $599, which gets you both the tablet and the keyboard dock.